We were sad to say goodbye to our new friends the Sommervilles in Bellingen, but it seems that new friends are around every corner! On our next stop at Thora, we met up with inspiringly thrifty travellers and also a lovely unschooler who shared her story with us. In what has become our usual style, we didn’t travel very far. 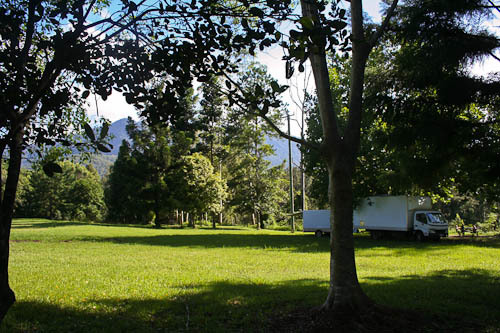 We drove away from Bellingen, but only about ten kilometres down the road. 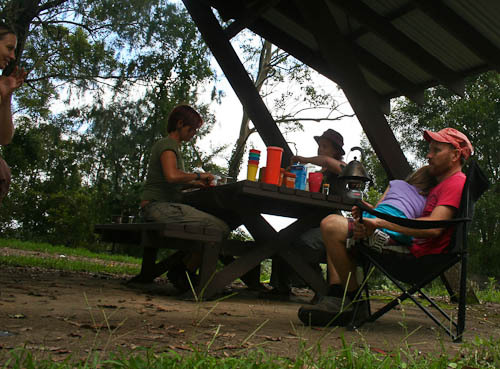 We parked for the night in a public park at Thora, a tiny junction on the road to Dorrigo. 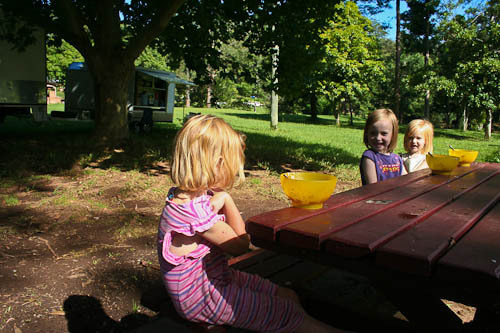 The girls enjoyed a breakfast outdoors under gloriously blue skies. Calista is developing an especially cheeky sense of humour. We are enjoying to get to know her and are learning to listen carefully to her perspective on our experiences. And after arranging a tentative meet-up with another unschooler at the “picnic area after the Thora store”, we drove off down the road, hoping that the place would be easy to find. It was. When we pulled in, a couple of uni students were cooking breakfast — banana pancakes — so we started chatting. Most travellers we meet are happy to talk, and we never cease to be amazed at the variety of demographic representations we meet while on the road. At home we seem to be stuck in a very middle-class rut of acquaintances, but while we’re away, this is definitely not the case! We congregated under a shelter constructed on the side of the road. It would have been a lovely spot except for the fact that a previous visitor had dumped a load of fish down the side of the near escarpment, and we were periodically overwhelmed by the stench. The two university students were travelling quickly up from Victoria and back again. 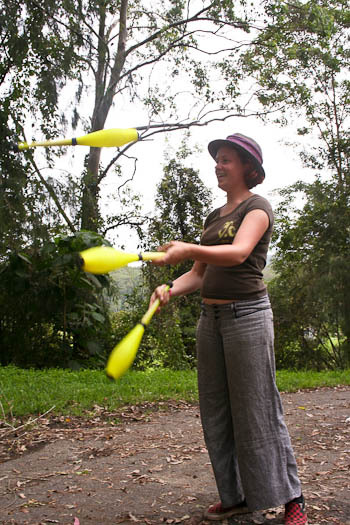 Esther was a German exchange student studying gender studies, and Elle was a member of the Melbourne Uni juggling club. Before she drove off, Elle spent some time practicing her juggling. After offering us some bulk food, the girls revealed to us that they go dumpster diving — digging around in the waste bins at the back of supermarkets. Esther said that they often find a six-pack of tins where one tin is damaged, and other times they pull out fresh fruit and vegetables that are considered past their prime. We were fascinated to hear about this. I’ve known that supermarkets throw food away, but I never before considered the bins as a free food source. Before they left, the girls loaded us up with blocks of parmesan cheese, bananas, broccoli and tomatoes — all in perfect condition but still discarded by the big supermarket chains. 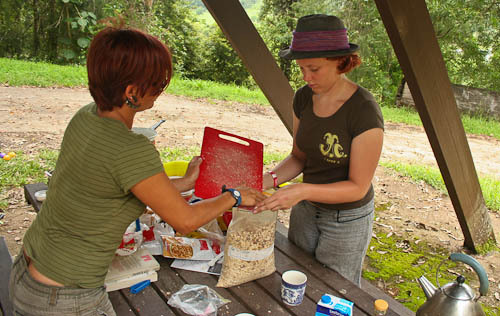 Esther and Elle combined a selection of bulk ingredients to make their own gourmet muesli. When our pre-arranged new friend arrived, we all shared stories together. Alice is a talented clothing designer who sells one-off items of clothes for children and adults. 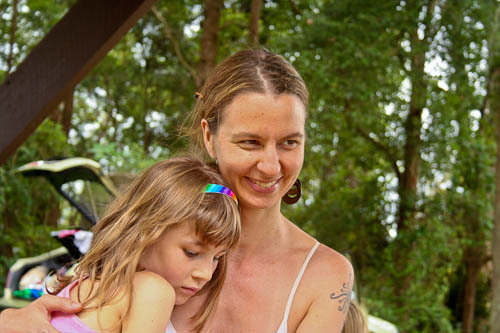 She is just transitioning into the practice of unschooling, because although she has long converted to the philosophy of it, she’s had her 8yo daughter in a local Steiner school for a couple years. Alice is a talented clothing designer and dresses herself and her two daughters in her unique pieces. 8yo Luna stayed with Alice while she chatted with us and ended up playing in the truck with our girls. We found it very easy to talk with Alice. She is passionate about so many good things and yet non-judgemental on areas where we differ. It was great to share our beliefs, sharing how we see the Bible as holy scripture and finding a way to relate authentically on spiritual matters. We were also inspired to hear that later this year, Alice and her two daughters will be moving onto a property with another unschooling family. Together, they will form a small village — with multiple ways to inspire, encourage and raise their children together. It sounds like a great idea — almost as good as travelling! I was so energised by meeting all these inspiring people! When it was time to go, we all drove off in our separate directions. We’re heading up the Waterfall Way to see … waterfalls! I hope to see rainbows too! It’s really neat that you’re getting the chance to meet a wide variety of people on your travels! Even though I have not had a chance to read heaps I am becoming further convinced that we won’t be unschoolers. :) How cute is that little Cali!!! I love that when we take a step outside our usual circles the amazing people God places in our path.